Although I have yet to create any content specifically for goalies yet, my experience in this area is strong. I have worked with goalies in the youth leagues, juniors, AHL, and all the way up to the NHL. Having worked with many goalies all the way up to the highest levels, I can tell you that goalies should NOT be training like their offensive and defensive teammates. Unfortunately, this can be an easy trap to fall into since you want to train with your friends and teammates and not just by yourself. To make matters worse, there is very little good content on the internet today that can clearly articulate the differences between the offense/defense players and goalies. Instead, they provide more “generalized” plans and throw you on a BOSU ball so they can pretend to call it sport-specific. The small areas/nuances goalies must concern themselves with in order to become the fastest, most reactive, and explosive goalies they can be comes with designing training programs that incorporate both personal experience and the cold-hard sports science research. Today, we’re going to discuss just one of the many factors that separate a goalies yearly training periodization from other hockey players. That is, the greater emphasis on the physical characteristic known as relative strength. Relative strength is the maximum amount of force an athlete can generate per unit of bodyweight irrespective of the time it takes to develop that force (so, power is not accounted for). To use relative strength in an example, think of Ben Johnson. On steroids or not, this guy had ridiculous relative strength. He regularly floated between a 170-180lbs bodyweight, but was known in the gym to squat 600+ pounds (Greater than 3x his own body weight). Most guys around 170-180lbs only squat around 250lbs if you go to the average gym. I also mean actually squat, not put the bar on your back and do quarter squats or half-squats and then high five your friends like you actually did something. In this scenario, Ben Johnson has greater relative strength than his equal weight counterparts because although they are the same bodyweight, Ben is much stronger pound for pound. Sounds a whole lot like a game of hockey in between the pipes to me. Training relative strength for goalies properly requires utilizing training methods and tactics to improve neural drive, and not necessarily make the muscle any bigger. A common myth in the locker room is that you always have to get bigger in order to get stronger, this just simply isn’t the case. The reality is that you can get much more relatively strong by training your nervous system to recruit more muscle fibers per contraction than it was previously. Meaning, we lift heavy weights using certain protocols to allow the nervous system to get us stronger without any real structural change to our muscle tissue. This is why sometimes you see in the gym, little guys out lift the bigger guys. Or, smaller powerlifters/Olympic lifters moving weights much larger than even the biggest bodybuilders. Size is correlated to strength, sure. But, you can get a whole lot stronger without getting any bigger. See Ben Johnson for this example, or, Michael Jordan’s famous Air Jordan dunk. This is all very important for goalies to care about because to be a brick wall in the net, the overall size of your muscle tissue reaches a definite point of diminishing returns. Do any of the all-time great goalies look like bodybuilders? But, are these all-time great goalies explosive as hell? This is largely due to relative strength. When a goalie reaches his or her optimal size that they feel the most athletic at, too much training focus towards absolute strength and hypertrophy can begin to hurt performance more than it supports it. This was heavily supported when research conducted by Richard et al demonstrated with time motion analysis that goalies spend 75.2% of the game in low intensity movement, 3.2% of the game in moderate intensity movement, and 21.6% of the game in high intensity movement. Long story short, you need to be explosive because that 21.6% of the game is where you are making all of your big saves and game moves. This time motion analysis also gives you some good insight on how your conditioning programming should look (hint: if you’re pushing prowlers around for longer than 10secs at any given time, you should probably stop). The biggest reason why I have my goalies incorporate relative strength programming (sets of 1-3 reps) more often than my offense/defensive athletes is the sheer importance of the need to be as fast and explosive as possible when diving from one end of the net to the other. Let me take you through an example. For simplicities sake, let’s say you can leg press 600lbs for 1 rep, and your friend can leg press only 500lbs for 1 rep. You are now considered more relatively strong than your friend. Now picture this leg strength driving into the ground, you are able to emit 300lbs of force per leg (600lbs / 2) into the ground whereas your friend can only emit 250lbs of force into the ground per leg. How do you think is going to get there faster? 100% of the time, the guy who is relatively stronger. I know it sounds counter-intuitive to some people who don’t fully grasp the “under the hood” mechanisms behind muscle physiology, but goalies should be lifting heavy and should have phases built into their yearly training periodization in order to account for this importance. You’re correct in that you need to work on being explosive and agile, but you are incorrect in your dismissal of heavy lifting. Relative strength directly brings you improved performance, maximum muscle fiber recruitment for explosiveness, improved neuromuscular efficiency, quicker feet, less injuries (due to being stronger throughout your ranges of motion), and greater agility due to the strength allowing you to switch faster from an eccentric to a concentric contraction. 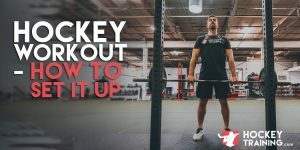 Beyond this, relative strength gets even better as it allows you to provide a greater ceiling of potential for your power output, which relies on your total strength limit. Strength can help you be more powerful, but power isn’t going to make you stronger. These are two very different things and are both equally important for goalies, but it’s important to understand that it’s your relative strength that is providing the ultimate ceiling for your power potential. Ideally, for relative strength development the total time under tension per set should be fairly short. 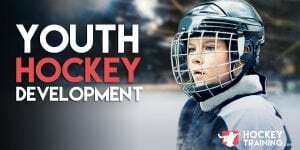 We do this to shift the emphasis off hypertrophic muscular development and place it on neural development, accessing only high-threshold motor units responsible for goalie performance. Additionally, by keeping the tension short you increase the athletes propensity to utilize the high-energy stored creatine and ATP that should be the primary fuel source for goalie performance. Typically for programming, I’ll have goalies perform 1-4 reps per set during these training blocks, and of course apply very short rep tempo strategies to keep the total time under tension minimal (i.e. train fast to be fast). A 30X0 tempo works great here, meaning, you lower the weight for 3 seconds, have no pause at the bottom, explode up as fast as you can, and have no pause at the top before you start your next rep.
Also, intent matters. It’s been demonstrated in the research that even if you aren’t moving the bar as fast as possible (possibly due to fatigue), if your mind is locked in on the idea that you are truly trying to move the bar as fast as possible, you will still gain neural adaptations in the muscle that will contribute to relative strength increases. Get your mind right! Bringing this to real world application, below you will find an example of a single lower body relative strength based workout for hockey goalies utilizing the Cluster Training Method. A1: Barbell back squat* – 5 x 1,1,1,1,1. *Choose a weight that is 90% of your 1-rep max. Perform 1 rep, rest 10 seconds, perform your second rep, rest 10 seconds, and repeat until you have completed all 5 reps. That is one set. From here, rest 120 seconds before moving on to BB stiff-legged deadlifts and performing the same style of repetitions. Once completed the 5 reps of BB stiff-legged deadlifts, rest 120 seconds and return back to Barbell back squats to start the second round, complete 5 rounds total. 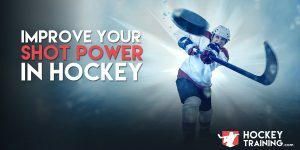 We plan to have more hockey goalie training posts and programs in the future, so make you’re checking our Hockey Training Programs page and following our hockey training emails to get notified when those are released! Love the goalie stuff. Keep it up. Maybe what goalies should do for cardio.